There is a lot of suffering in the Prado, and I’m not referring to how your feet feel after walking for hours through Madrid’s world-class art museum. The collection includes Goya’s famous Third of May 1808, which depicts Napoleon’s soldiers firing point-blank into a group of captured rebels. The Triumph of Death, by Pieter Bruegel, isn’t exactly warm and fuzzy. The Prado has many images of the crucified Christ, too — a popular theme for artists during the Counter-Reformation. But pain and suffering are by no means all that the Prado has to offer; there are also portraits and landscapes and genre scenes that are likely to evoke appreciative smiles. Foremost among these is a towering artistic achievement located in room 12 of the Museo Nacional del Prado: Las Meninas, by Diego Velázquez. So what’s the big deal about it? At first glance, you see an elaborately dressed little girl who appears to be about five years old. She’s being fussed over by a couple of ladies-in-waiting, or “meninas”. But why is the painting named for them? They don’t seem to be the subject matter; in fact they’re almost the only people in the painting who aren’t looking straight at… whoa. Most of the people, and maybe even the dog, are looking straight at the viewer of the painting. You. It’s as if you just stepped into this room in the royal palace, interrupting whatever it was they were doing. There’s a painter on the left — it’s Diego Velázquez himself, who probably didn’t look this young when he painted Las Meninas in 1656; he was in his late 50s by then. Anyway, Velázquez has an enormous canvas he’s working on, but he can’t be painting the Infanta Margarita (that’s the little girl’s name) or her entourage, because they would be facing him, not us. As you study the painting for clues, you notice a couple reflected in the mirror on the back wall. They are the king, Philip IV, and Queen Mariana. OK, so is that a reflection of the canvas — a portrait of the royal couple that Velázquez has basically finished? Or… are the king and queen currently posing for him, in effect standing in the space we occupy? If that’s the case, that suggests that we are seeing the room through the eyes of the monarch. That might also explain all the activity around the Infanta Margarita. As art historian Lois Fichner-Rathus speculates, “Is the princess being given a few finishing touches before joining her parents in a family portrait?” In other words, is she about to be placed in the space we occupy? That’s what is so fascinating about Las Meninas: in a sense, the viewer completes the picture. Not to brag, but one day in the Prado, I was the star of that painting just by standing in front of it. Then I reluctantly stepped out of the way and let a German tourist have his moment of glory in one of history’s greatest paintings. 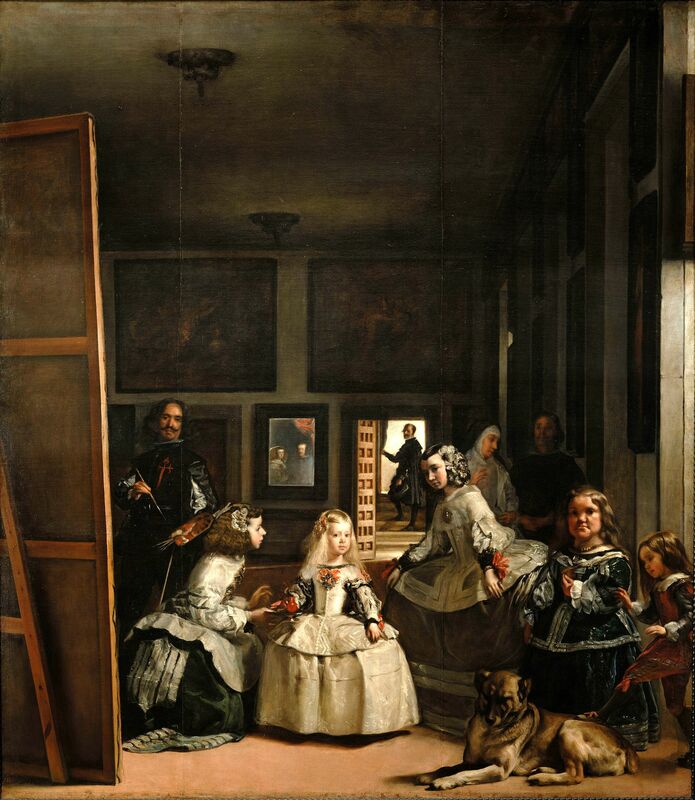 This entry was posted in Art and tagged Diego Velazquez, Las Meninas, Prado Museum. Bookmark the permalink. Great post! Can’t wait to see it in a few short weeks – I’ll be thinking of you when I do! Why did they remove the painting to another room where you cannot see it reflected in a mirror and therefore cannot see yourself IN the painting? It has lost all it’s charm.